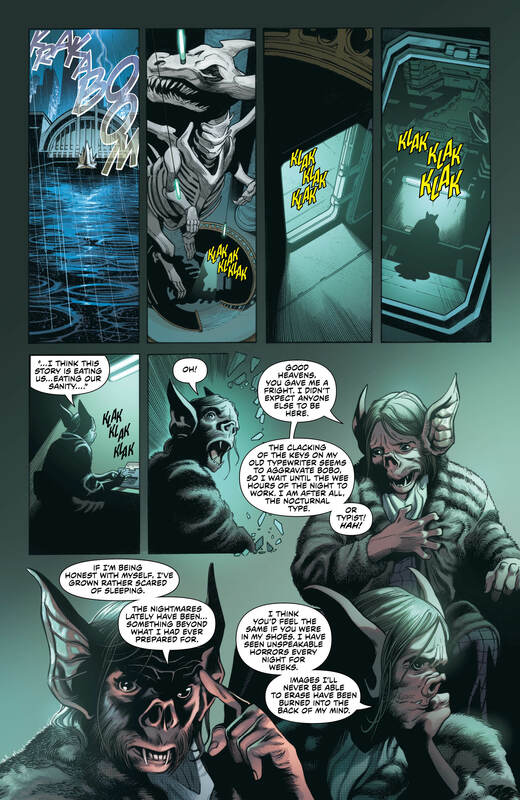 The latest chapter of Justice League Dark was very interesting in terms of both content and delivery, feeling more like a classic episode of Tales From the Crypt (albeit one with DC guest stars) than the usual action-packed issue. But that’s not to say it’s still not business as usual for our motley crew of misfits. 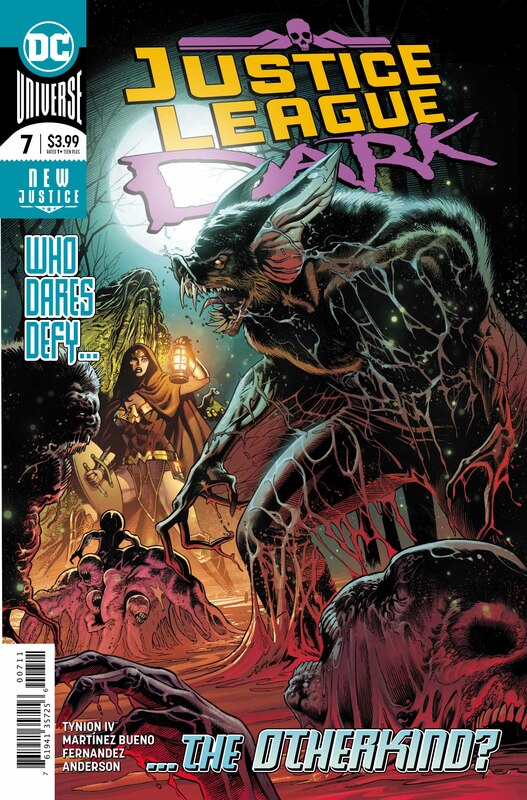 After the brief departure from the main arc in the last few issues the JLD are back on the trail of the Otherkind. Narrated by Man-Bat in his dark and dingy inner sanctum, everything matches those classic ‘80s/early ‘90s shows we all know and love, even down to the lightning bolts lashing outside. 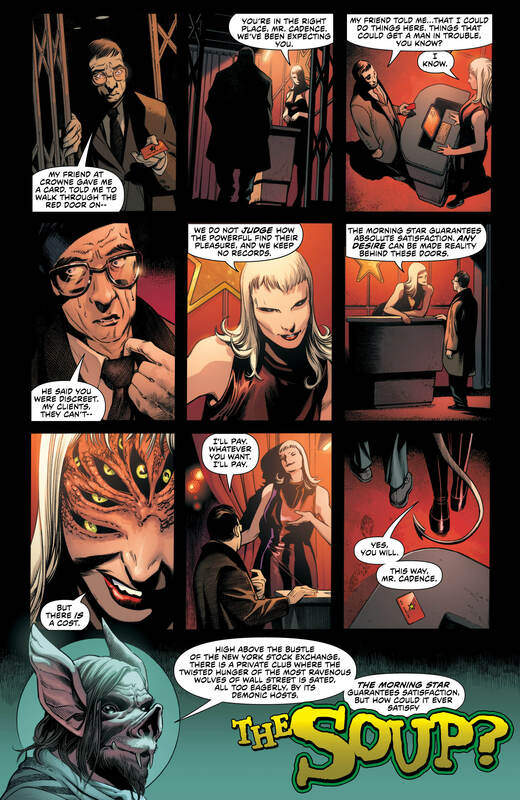 Langstrom regales us with three tales of recent events in which we discover that the Otherkind aren’t just biding their time to take the world apart, they’re already here and making quick work of taking down some heavy hitters in the magical world, with the JLD always seemingly one step behind them. Artist Alvaro Martinez Bueno does a fine job of putting the readers on edge with his increasingly gory and bleak artwork here, once again recreating some fan favourites from prior Vertigo and JLD stories alike. 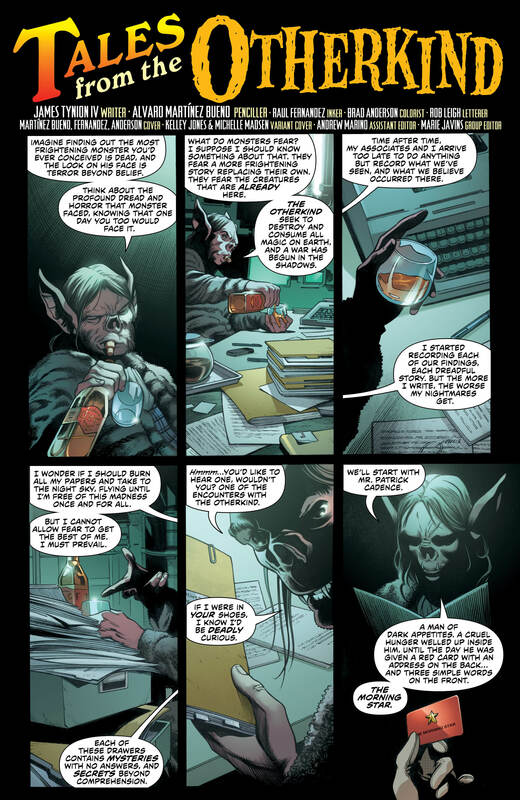 He also adds some truly unnerving demons and Otherkind, which help to build and establish the seemingly insurmountable odds our heroes are facing. 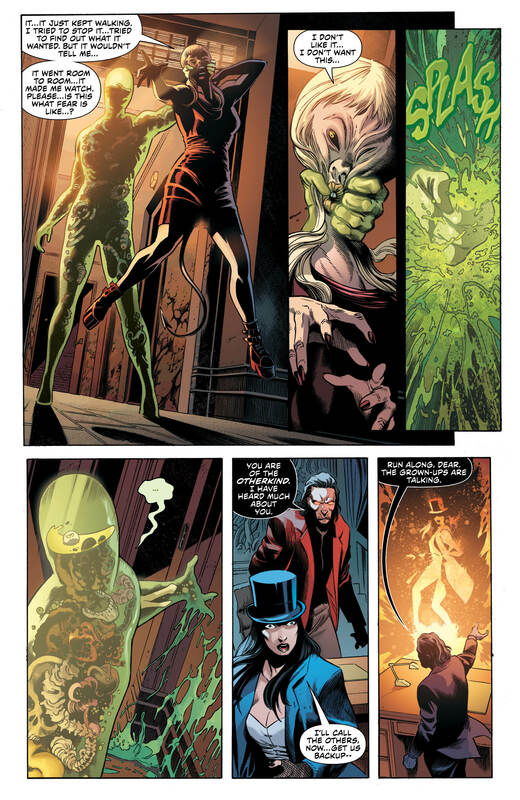 In fact, these odds seemed to be getting to the point where it honestly seems like there’s no way out for a powerless Zatanna, a Swamp Thing cut off from the Green, an out-of-her-depth Amazonian, an alcoholic detective and a reformed bat criminal. 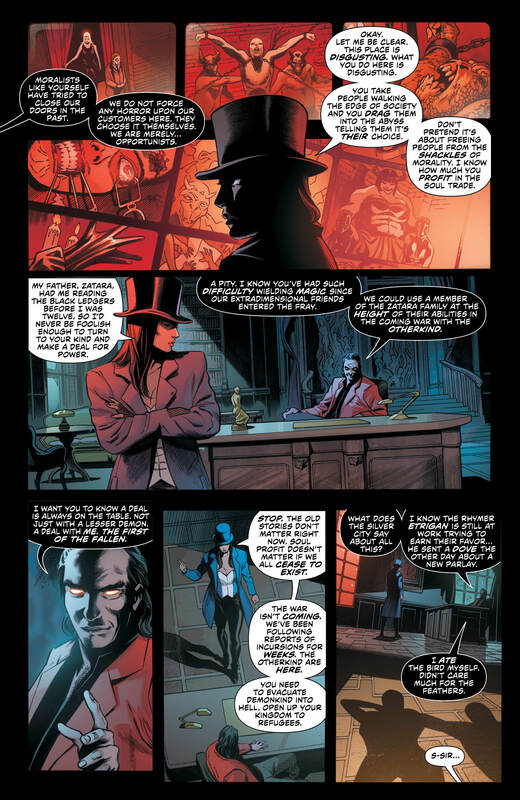 However, just when it seems all hope is lost Tynion reveals a hidden gem of back story for Zatanna and the previously unknown truth of her upbringing. I liked the feel of this issue because it wanted to try something different, an approach which you don’t often see in mainstream comics. Tynion has been doing a great job of providing fan service to older fans while at the same time enjoying the hell out of playing with characters that you’d think would have no place in a story like this. Time and time again he and the rest of the creative team have proved the naysayers wrong, most recently in this very issue as he introduces characters only to have them leg it away from trouble or find themselves being literally eaten alive trying to fight back. While it could perhaps be viewed as a bit of a filler/reintroduction to the main plot, this is still a cool issue and well worth picking up as we begin the journey towards the impending big boss battle that we’re clearly heading for in the coming months.